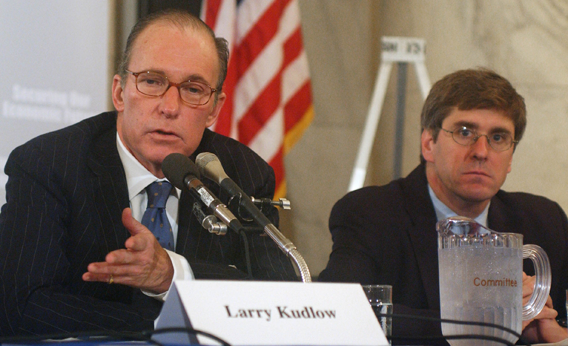 Larry Kudlow says the Libor conspiracy has no victims. That’s grotesquely wrong. Photograph by Scott J. Ferrell/Congressional Quarterly/Getty Images. The Libor scandal is perhaps the biggest market-rigging conspiracy in the history of global financial markets. Almost all interest rates are affected by Libor, so every person with outstanding bank-issued debt could be a victim of this cartel. This is Alice in Wonderland logic: saying the criminal is the victim. Let’s be clear: Every person whose interest rate depended on Libor is a victim. The rate you paid was not the product of honest competition and reporting. Some people lost lots of money because of the manipulation—other may have saved some—but the game was rigged. The integrity of the market was destroyed so the banks could put money in their own pockets—our money. Kudlow’s statements are simply ridiculous, but there is something deeper going on here. When you claim “no harm, no foul”—even though there was plenty of harm and plenty of foul—then you also are denying the need to reform the structure that caused the problem. But in the real world, rigging these markets and violating every one of the fiduciary relationships underlying Wall Street’s integrity has led to a general degradation of our financial system and the destruction of trust. The cost of that has been unfathomable. Why can’t the defenders of the status quo just wake up and admit it?